√ Super Absorbent: water absorbing capacity is 6 times more than normal towel. √ Advanced technology ensure that the towel has soft feeling and no fur shedding. √ Our environmentally friendly towel is made from good material so that it is durable. 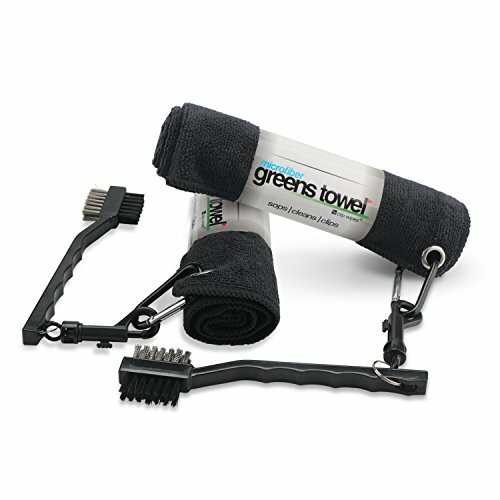 √ This set tool provides golfers with the ultimate cleaning combination of a convenient microfiber towel and a handy club brush which are perfect for cleaning your ball or wedge. NECESSITY OF GOLF CLEAING: Golfers are experiencing great shots and good results more often by keeping their golf accessories in peak condition, which is clean, no dirt, sand and grit within the grooves. DROK golf club brush & towel cleaning combo can help you do this job. HANDY MICROFIBER GOLF TOWEL: With compact size(16″x 16″) and carabiner clip, DROK multifunctional black golf towel is convenient for you to carry out for outdoor sports and can be used to clean your golf ball before putting, clean your iron after an approach. HIGH QUALITY FIBER MATERIAL: Our sports towel set adopts soft and pliable microfiber material and advanced technology, super absorbent, comfortable, no fur shedding and environmentally friendly. 2-SIDE GOLF CLUB BRUSH PROVIDED: Our golf towel microfiber kit is provided with a bass & nylon bristles 2-side brush, which can be used to clean golf head and create better contact with the ball resulting in better ball flight and more back spin. WHAT U GET: The package includes 2 x Microfiber Tower with Brush. If there is any question, please feel free to contact us. All we want to do is to help you have a great joy on playing golf.